A Pirate Boat wouldn’t be a Pirate boat without Pirate Badges. This was the original reason we invested in our badge maker and software, to add our own products to our stock lines. 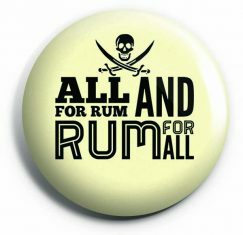 We spoke to fellow boaters to get their ideas and favourite Pirate quotes and then the designing began. 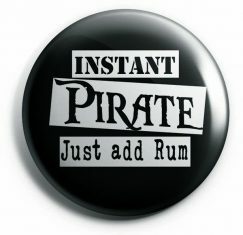 These were all to be originally sold from the boat but then we were asked to supply badges for Pirate birthday parties and so on, hence our online business grew. 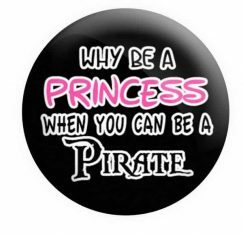 Well of course we do, I mean why can’t girls be Pirates? In fact there have been many amazing female Pirates through the years including Anne Bonney, Mary Read and obviously the crew aboard the Pirate Boat. 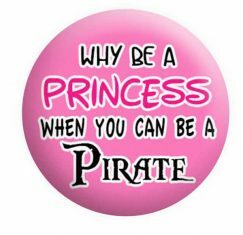 Our ‘ Why be a Princess when you can be a Pirate’ Badge is perfect for all those budding little Lady Pirates out there. As with all our badges, they come in various sizes in addition to key rings and bottle openers. 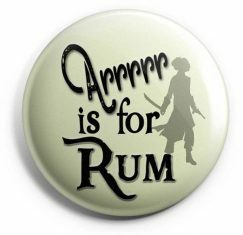 You can find all our nautical themed badges in our Boats & Pirates Category.